For those of you who love the fun and quirky Todd Liberty Parade that takes place each year on July 4 in downtown Todd, you should not notice many differences in the 2017 parade from previous years. Anyone who wants to join in the parade can pick out a costume or banner at the start of the parade and walk less than a mile through downtown Todd to Cook Park. The King Bees will be performing live music and there will be dancing and food to purchase in the park. It will be the same amazing and one-of-a-kind event as in past years. 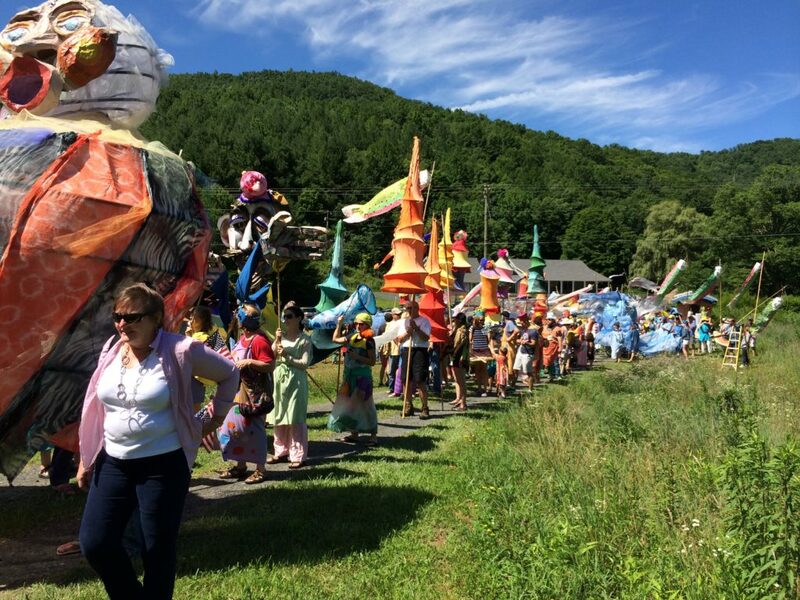 Behind the scenes, Elkland Art Center (EAC) has passed the baton for parade management and ownership of the costumes and props to the Todd Community Preservation Organization (TCPO) beginning spring 2017. The TCPO is happy to be able to continue the parade tradition with the fabulous costumes and decorations made by EAC and their volunteers. Many thanks to EAC founder, Martha Enzmann, and the EAC staff for their creativity and leadership over the past 11 years. The 2017 Todd Liberty Parade theme is “Let’s Peace it Together”. July 4th is a wonderful opportunity to remember the importance of peace throughout the country and world and the importance of working together to bring it about. The parade starts at 11:00 a.m. If you want to walk in the parade, please be at the big field at the corner of HWY 194 and Todd Railroad Grade Road at 10:00 a.m. to pick out your costume or prop and line up. Parking is free with a suggested per car donation of $5.00. Plan on staying for lunch and enjoy the music after the parade. There will be food hot off the grill, as well as snacks and drinks for purchase in the park. It takes a lot to put on a parade. Although it is free for all, as in past years, the TCPO has set up a special fundraising campaign specifically to offset parade expenses and help sustain it for future years. We greatly appreciate any and all donations. Please visit crowdrise.com to make an online donation. Checks may be made out to TCPO with Todd Liberty Parade in the subject line and mailed to TCPO, Box 15, Todd, NC 28684. The TCPO is a non-profit organization and donations are tax deductible. If you would like to volunteer for the parade or rent out props for your event, please contact us. In case of rain, please check back here. We hope to see you on July 4!